We'll only learn the stock ticker when the company files for an initial public offering (IPO) with the SEC, which could happen next spring at the very earliest. But there's a way to make money from the hype around the SpaceX IPO now, before the stock debuts on the market. It's one of Money Morning Director of Technology & Venture Capital Research Michael A. Robinson's favorite investments. The hype surrounding SpaceX mainly stems from its massive valuation, which just grew to stunning $21.2 billion in July. That makes it the fourth-most-valuable private tech firm in the world. SpaceX's latest funding round was enough to push the company's valuation from the No. 10 spot into the top five. In its Series H round, the company received $350 million in funding from "undisclosed investors." This boosted the valuation by 76.7%, from $12 billion to $21.2 billion – knocking WeWork's $20.8 billion valuation out of the No. 4 spot. 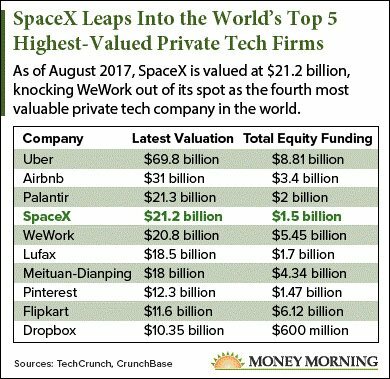 Although the valuation is now the fourth highest in the world, we don't know what SpaceX stock will cost until after the IPO. Investors will value shares of SpaceX stock based on the firm's ability to reuse rockets and launch broadband satellites – two initiatives that just started ramping up in March and May, respectively. IPOs can be volatile – and therefore risky to buy – in the months following their public debut. That's because investors are still trying to appropriately value the company after it hits the market. Facebook Inc. (Nasdaq: FB), for example, fell 44% during its first three months from May 2012 to August 2012. It's since rebounded 807%, from $19.05 in August 2012 to $172.78 today. The recommendation is an exchange-traded fund (ETF) that can be bought and sold like a regular stock. But ETFs are different, because they let you hold a basket of different stocks at once. This can give you exposure to several areas of the market with just one investment. His ETF pick today exposes you to both new IPOs and newly formed companies. This gives you exposure to new companies and IPOs, but the diversity of the fund limits the risk.